A thirteen-year-old boy named Brian Robeson is the only passenger on a small plane that is headed towards the oil fields of Canada. Brian is going to spend the summer with his father, and is exasperated that his parents have divorced. The plane suddenly starts to go down and Brian discovers that the pilot has had a heart attack and is now dead. 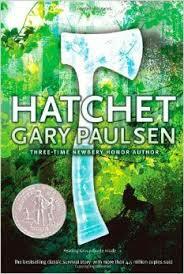 Brian finds himself stranded on a island with only a hatchet that his mother has given to him. Brian realizes that it is going to take awhile for someone to notice that he is gone, and so he will have to learn how to survive in the wild. A couple of days later a rescue plane flies around the area where Brian is located but they do not see him. Brian starts to stop believing that he will be found. As days go by, Brian becomes tougher and more mature than he was before. He learns how to make a bow and arrow, to fish, to hunt birds and rabbits, and to create a shelter. He has dealt with a skunk, a moose, a porcupine and a tornado. The tornado changes Brian’s way of living in the wild. The tornado demolishes everything Brian built. It even moves the crashed plane closer to the shore where Brian is staying. Brian starts to think about how he can use the plane as a resource. Brian remembers that there was an emergency pack in the plane. He begins to collect items on the shore that would assist him in getting to the crashed plane. When I got assigned to read Hatchet, I knew I wouldn’t like it since I hate reading, but after reading a couple of chapters I was intrigued by the story line. Brian’s life has been changed since his parents got divorced. While he was stranded on the island, he learned many new skills, such as making a fire, hunting, fishing, building a shelter. He started to mature and become emotionally stronger. Through Brian, I learned that maturity can arise from many different situations. Maturity is not just about getting older. It is about how you handle yourself in tough situations. The words that the author uses in the story are complicated and hard to understand. The author’s use of words create a clear image in the readers’ minds. I would recommend this book to middle schoolers because of the high vocabulary and the exquisite story line. I give this book eight out of ten stars. 1. What was the worst pain that Brian felt when he woke up the next day? 1a. He felt his head throbbing (pg. 33). 2. Why did the Cessna crash? 2a. The plane crashed because it ran out of gas (pg. 25). 3. How often did Brian use the radio to call for help? 3a. He used the radio every 10 minutes. (pg. 20). 4.Where was Brian Robeson going over the summer with his dad? 4a. Brian was headed to the oil fields in Canada. (pg. 20). 5. Why did Brian parents divorce? 5a. His mom was involved with another man and his dad found out so they broke up. (pg. 6). 6.How will Brian make a fire? 6a. Brian will make a fire by using the sparks from when the rock scraped against the hatchet. (pg. 86). 7. What animal hurt Brian? 7a. A porcupine hurt Brian. (pg. 81). 8. How has Brian’s body changed since he crashed in the Canadian wilderness? 8a. Since the crash his stomach has curved in, his skin is tanned, and his face is leathery from the sun. (pg. 104-105). 9. What tool must Brian make to be able to hunt? 9a. To hunt, he must make a bow and arrow. (pg. 124). 10. What did Brian do when he heard the plane? 10a. When Brian heard the plane, he ran to the hill to make a fire. (pg. 116). 11. How did the moose react when it saw Brian? 11a. The moose attacked Brian when he saw him. (pg. 150-151). 12. How was Brian able to get into the plane? 12a. To get into the plane, he had to cut through the aluminum with his hatchet. (pg. 173-174). 13. What made Brian sick when he was under the water looking for the survival pack? 13a. Brian got sick when he saw the skull of the pilot (pg. 180-181). 14. How did the item in the survival bag change Brian? 15. When Brian was preparing his feast, what appeared out of the sky? 15a. A airplane appeared out of the sky. (pg. 190-191).